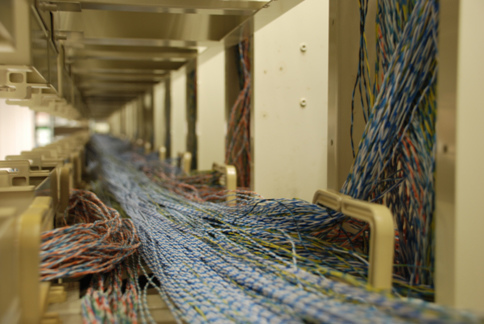 The central office (CO) is the point at which all of the local telephone trunks converge through an intricate system of switching equipment, and where each call connects to its destination electronically. It is where all the voice or data traffic from a telecommunications network flows from its start to end point for the duration of a call. This article aims to take you on a virtual journey of a typical telecommunications central office, explaining the functions and systems that operate at key points within these critical facilities that provide the telephone services that we rely on every day. Thousands of pairs of cables are fed from the streets in the local area and enter the CO through thick concrete bulkheads, into what is usually a lower level chamber or vault. The cables, which vary in size, are twisted together in pairs to differentiate each phone circuit. Internal pressurisation is used in the cabling to keep water and other obstructive materials from causing damage and all the cables are grounded to avoid the damaging effects of lightning strikes and other electrical surges. 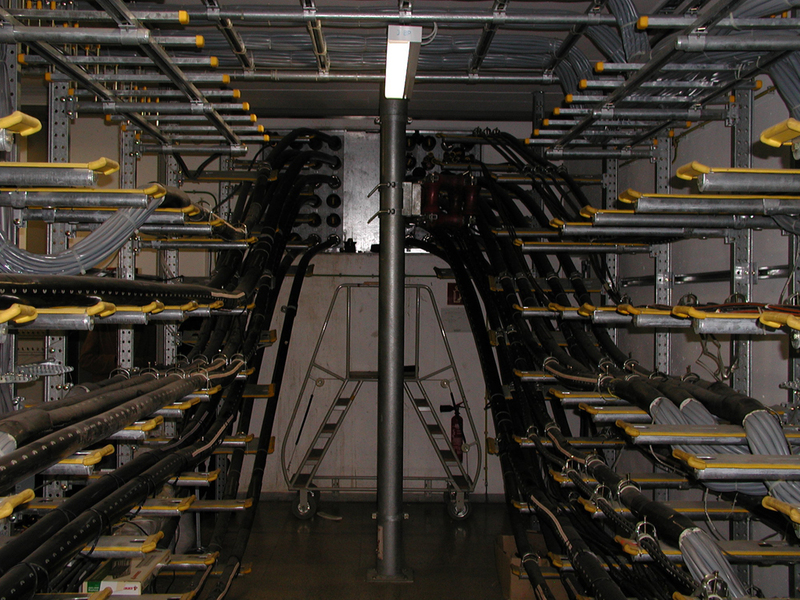 Steel racks are used to run the cabling along the walls of the vault and help to keep everything neat and orderly. In case of a failure of service, large back-up power generators will kick in to keep the critical infrastructure running until mains supply can be re-established. These are usually housed in the cable vault and are fed by large cooling fans that also operate in case of an emergency. In most CO’s these are tested each week to ensure that they are in full working order. All of the twisted-pairs of cables are fed from the cable vault, often in to a separate room, where they meet the main distribution frames (MDF) as well as fiber cables which meet their equivalent optical distribution frame (ODF). 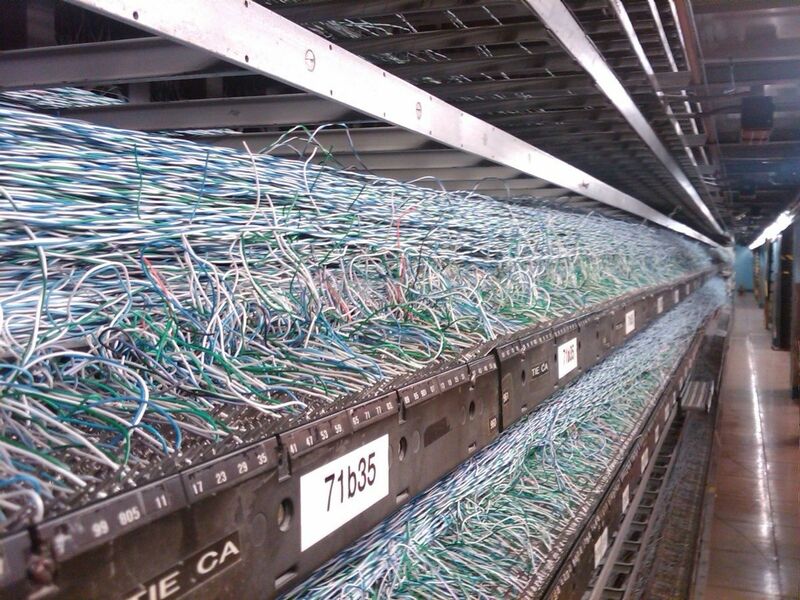 These frames are used to connect all of the individual wires that are being fed from the cable vault by joining them with feeders that lead to the switching equipment. With the increasing use of fiber ODF’s are now more prevalent within CO’s. An optical distribution frame (ODF) is a frame used to provide cable interconnections between communication facilities, which can integrate fiber splicing, fiber termination, fiber optic adapters & connectors and cable connections together within a single unit. It can also work as a protective device to protect fiber optic connections from damage. The amount of wiring that is involved at this point is quite incredible. All of the wires are spread out across a vast latticework of steel racks, sometimes hundreds of feet in length. Between the front and back of the frame, an engineer connects a pair of wires from one side to a pair of wires on the other side by spooling out what is called ‘cross-connect’ wire along the frame, from one termination to another. You may wonder why the cables from the street aren’t wired directly to the switches and why the main distribution frames are used. The reason is, that should a cable pair become damaged outside of the CO, the circuit can be switched over to another available pair and functionality is restored. Not only that, but when a person moves house within an area, they may ask to keep their existing number. 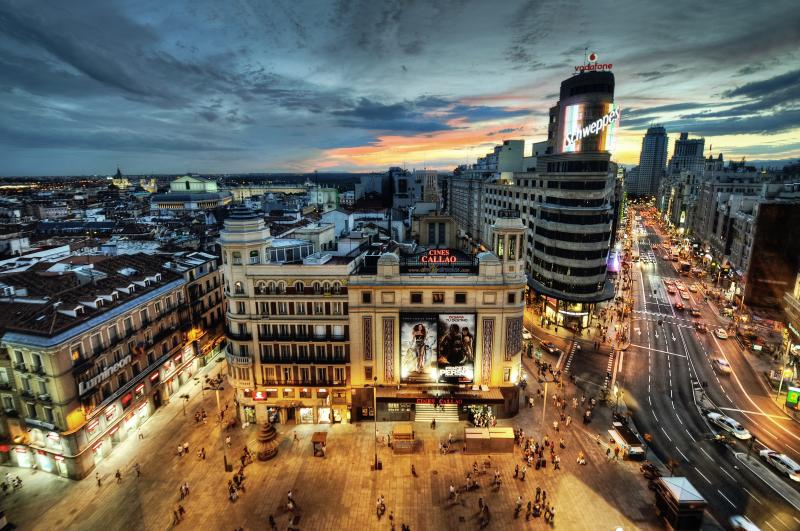 To make this easier for the telephone provider, intermediate cross-connect facilities and distribution frames between the underground cables and the switches are added by the provider. Usually held in a separate room is the local-loop termination equipment. 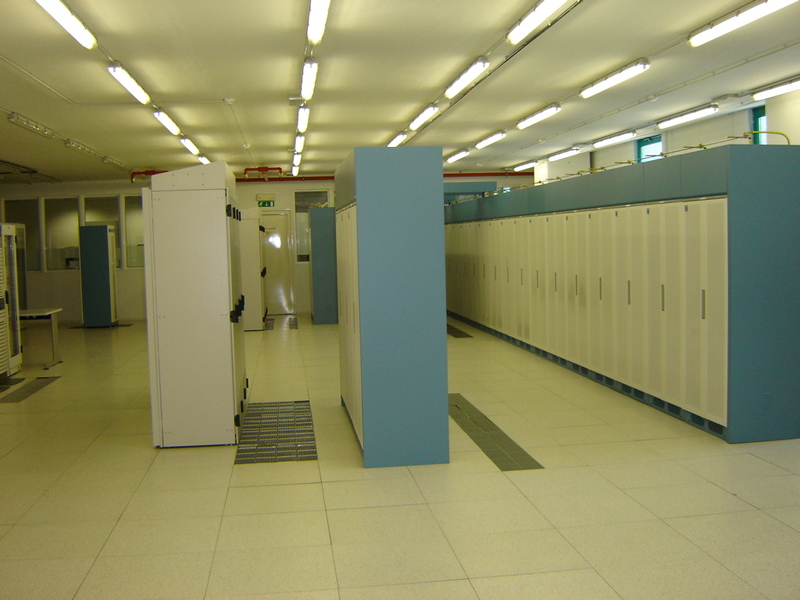 This equipment comprises of racks of chassis which contain modules that provide diagnostic capabilities for monitoring the circuits and other service functionality. If one of these cards becomes faulty they are easily able to be removed and replaced with a replacement or upgrade. The switch is the brains of the telecommunication central office. Although a switch is usually described as a complete system, for example the Siemens EWSD or Nortel DMS 100, in fact, it is physically variable in size and parts and the name simply refers to the family of equipment that in its totality is described as “the switch”. 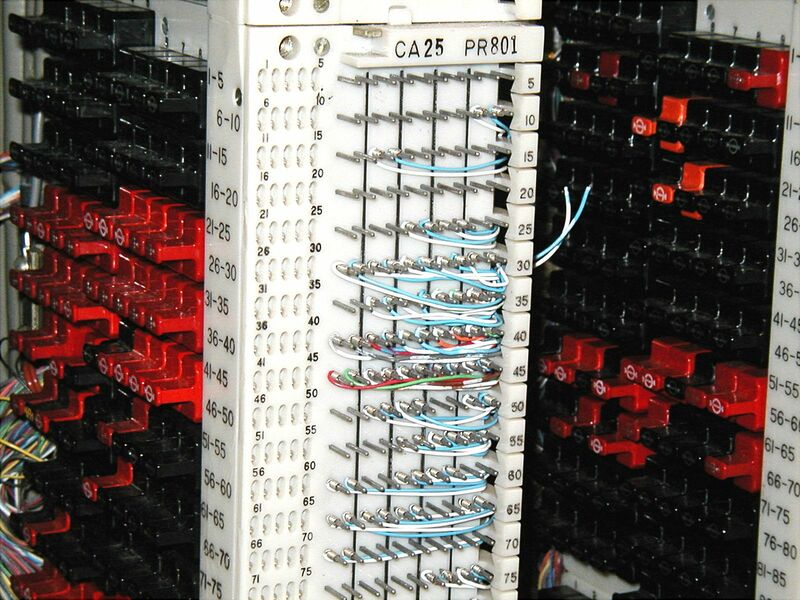 The main components of the switch are modular cabinets that house chassis, which themselves contain circuit cards that interface with the telephone lines. Some also contain additional equipment such as memory drives. For obvious reasons this technology is built to last, and for that reason the equipment can be large, often military grade in appearance. It is also the reason why resale and refurbish companies like Carritech are able to continue to supply legacy hardware that works just as well as if it were new. In principal, the switch is a large computer which simply switches circuits around for the phone connections that are established and fed to the building from within the surrounding area. Other tasks include connecting long-distance calls to the appropriate carrier trunks. Of course, internet access equipment is also located in the Central Office. We are referring to DSLAMs (digital subscriber line access multiplexer) such as Lucent Stinger or Alcatel ISAM/ASAM and PON (Passive Optical Network) equipment. In addition to this, there are often rooms of equipment dedicated to re-routing and carrying traffic out to other parts of the network. These devices allow for management of end-user services by the provider. Telecommunication provider’s central office setup vary from company to company, but we hope this article has helped to explain the inner workings of the critical infrastructure it houses. 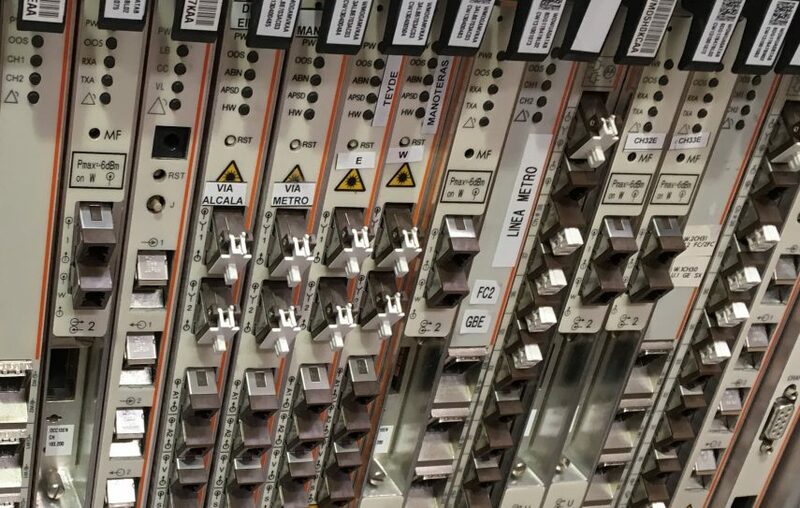 As the telecoms industry adopted an adaptable architecture very early on, the equipment within a CO may vary from day to day, with new and replaced parts taking over where faulty or outdated counterparts are no longer useful. For that reason, most central offices design has remained relatively unchanged over the last few decades. When replacement parts are needed by the network provider, Carritech are able to supply and source hard to find parts to keep this critical infrastructure in perfect working order.